(rollover to compare with normal) How Is It Treated? Medications may help stabilize a patient with Hypoplastic Left Heart to some degree, but surgical management (Norwood Procedure, Sano Modification of the Norwood Procedure, Hybrid repair, or a heart transplant), will be necessary within a few days of birth. In the Norwood Procedure (see diagram at left), a major blood vessel to the body (aorta) is constructed from the base of the pulmonary artery and the narrowed aorta, indicated by the presence of the pink patch in the animation. In addition, a small tube made of Gore-Tex (known as a Modified Blalock-Taussig Shunt), shown in yellow in the left diagram, is inserted between the branches of the pulmonary artery (PA) and a branch of the aorta to ensure blood flow to the lungs after the PDA closes. The Sano Modification of the Norwood (diagram at right) involves the placement of a conduit (light blue) between the pulmonary artery and the right ventricle instead of the Modified Blalock-Taussig Shunt. Hypoplastic left heart is in the spectrum of single ventricle defects that has a sequence of staged repairs. Initially the Norwood and its variations as a neonatal repair, with a bidirectional Glenn repair at 6 months of age and finally the bicaval pulmonary anastomosis (Fontan) at 3-4 years of age. 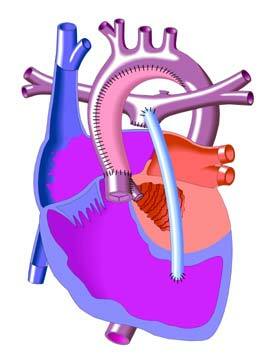 The Fontan is the final repair for staged palliation of Hypoplastic Left Heart Syndrome.